A great roundup of housewarming gift ideas that are stylish as well as practical. Now is the time of year when many people are moving and a housewarming gift is a thoughtful way to share the excitement! Whether moving up or down, buying or renting, moving into a house, townhouse or apartment, perhaps you’d like to make your friends or family members feel extra special with one of these stylish, yet practical housewarming gift ideas. You just may just want some of these for your own home too! Spring and summer is a busy real estate season and the months are filled with people moving to new homes. Even my own daughter will be moving to a new home soon. You can always go with something traditional like a houseplant or bottle or gift card of some kind, but if you’d like something a little more stylish, yet still practical, check out my picks! 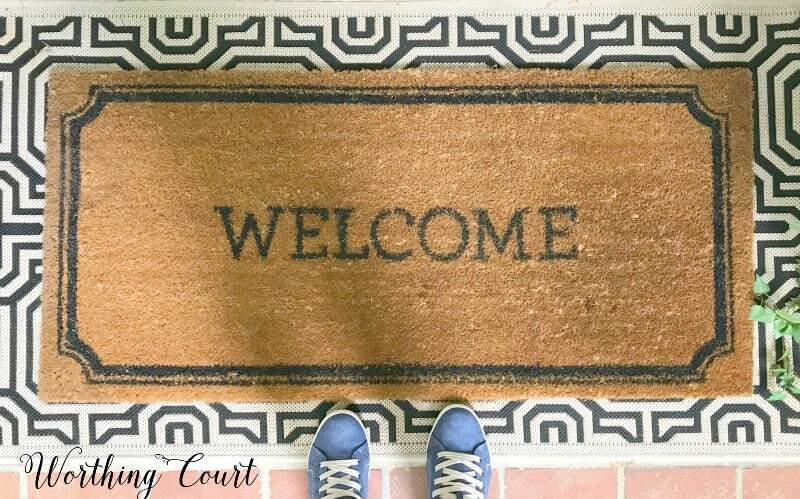 WELCOME MAT: There are thousands upon thousands of welcome mats available! In spite of how cute and trendy some of them are, a classic welcome mat with a simple message and clean lines will always be in style. MARBLE AND WOOD CUTTING BOARD & CHEESE KNIFE: Make sure you show up with some cheese and fruit too for an impromptu celebration. CUSTOM ADDRESS STAMP: Find out the new address beforehand and order this personalized stamp for a unique and super useful gift. Available in multiple sizes and colors and super affordable. CHEF’S DAUGHTER TRAVEL SPICE KIT: Restocking your spice cabinet can be a real aggravation. This assortment of herbs and spices will make getting settled into a new kitchen so much easier and more convenient. MAKE YOURSELF AT HOME: This book will help them to create a places that feels like home with all the tips anyone will need to stay organized and on top of their game. WOOD SALAD BOWL AND SERVER SET: Bring all the ingredients for a scrumptious salad too! TEAK WOOD PIZZA OR ANTIPASTO SET: It’s a fair bet that there will be a lot of pizza eating right after a move. Combine this with the wood salad bowl and server set! ROPE KNOT DOOR STOP: The perfect gift that you never know you need, until you actually need it! DISPOSABLE DRINK COASTERS: Super handy for when all those guests stop by to tour the new home. Available in multiple sizes and designs. 65 – PIECE HOMEOWNER’S BASIC TOOLKIT: Wow – this one speaks for itself. How handy to have the most commonly used tools right at your fingertips. Hmmm….this makes me wonder if I need to move! « A Living Room Makeover Created With Summer In Mind – Before And After Room Reveal! Great gift ideas – not just for housewarmings, but any occasion! Thanks for sharing!